The design is sleek and immediately recognizable. Styled like a futuristic Moroccan Tajine this pressure cooker is solid and it feels and cooks with quality – this is the most efficient pressure cooker I’ve tested so far – and it’s easy to use but its Swiss precision does not account for human imprecision. Attractive Design – The Kuhn Rikon Duromatic does not look like any other pressure cooker on the market today. Its coned top is beautifully minimalist with just a few concentric circles to the peak and a little nub in the middle- the pressure signal. The base is a simple cylinder and in contrast to all of this roundness the handles feature sharp angles and undulating lines at the same time. Easy to Use – Put on the lid and go. No other buttons, levers or settings to choose. The pressure valve is easy to remove, clean and remount. Fill Lines – Capacity marks inside the pot indicate 3/4 full (for regular pressure cooking) and 1/2 full (for cooking grains, beans and other foamy foods). All-metal Valve – The pressure regulator, and its housing, are all metal (save the small heat-safe plastic button on top) making this valve extremely durable compared to its peers. The Kuhn Rikon has more safety systems than most other pressure cookers, but gets a small ding in this category. This “ding” does not render it unsafe but is a minor design flaw – see Safety Vents, below. Primary over-pressure release valve – Integrated in the pressure signal, activates to release pressure if the pressure cooker reaches 17.4 PSI. Secondary safety valve – Located a small distance from the primary pressure valve, a small spring fixed silicone stopper will pop out and release pressure (in case the primary should be obstructed or not working properly to release pressure). Correct Placement Nub – A little nub within the lid’s rim retracts when the pressure cooker is closed correctly. Should the lid be placed on the cooker incorrectly, this nub will prevent the pressure cooker from reaching pressure. Self-locking Gasket – Once the pressure cooker has reached pressure, the silicone gasket will expand to lock the lid of the pressure cooker closed. I have not tried, but the Kuhn Rikon product manager assures me, that even a strong man cannot forcefully open the pressure cooker while the gasket has expanded to maintain pressure and block the lid from twisting open. Safety Vents – The Kuhn Rikon boasts two safety vents that come into action in case any of the previous safety measures were to fail. At that point, the gasket will buckle and allow pressure (and some of the contents of the pressure cooker) through the metal cut-outs in the lid. The cook should always point these windows in the rim away from him while operating the pressure cooker. On this model, the vents are on each side of the lid, making it difficult to understand how to position the cooker with both vents pointing away without having the handle stick straight out from the cook-top. This is where Swiss precision locks horns with human imprecision, and its unparalleled efficiency shines. Durability of the materials is also a winner – though a decorative piece is unnecessarily flimsy (removing a quarter star from the rating – see last paragraph in this section). The Kuhn Rikon pressure regulator consists of a bar, a spring and a little top. The simplicity and materials make this valve easy to clean and incredibly durable. The pressure indicator is the small black point in the middle of the cone-shaped lid. When the pressure cooker reaches pressure the indicator begins to rise out of the housing to display the metal bar. When the first red ring on the bar is seen, it means that it has reached “Low Pressure” when the second red ring displays it means that it has reached “High Pressure”. The advantage of an indicator bar vs. a pressure selector, is that the cook can turn down the heat while the bar is in any position to maintain that pressure. For example, anywhere between the first or second ring for “Medium Pressure” or just before the first ring for “Extra Low” pressure. Figuring out the correct heat to maintain pressure point has taken me a lot longer with this pressure cooker than any other so far. The Kuhn Rikon will maintain pressure only when a precise amount of heat is applied – since the knobs on many cook-tops do not have any numbers or marks the cook really need to learn to feel where this precise spot is. This takes a few initial recipes to discover. However, once you find the “sweet spot” for how much heat is needed to maintain pressure you will be pleasantly surprised at how low you can go. 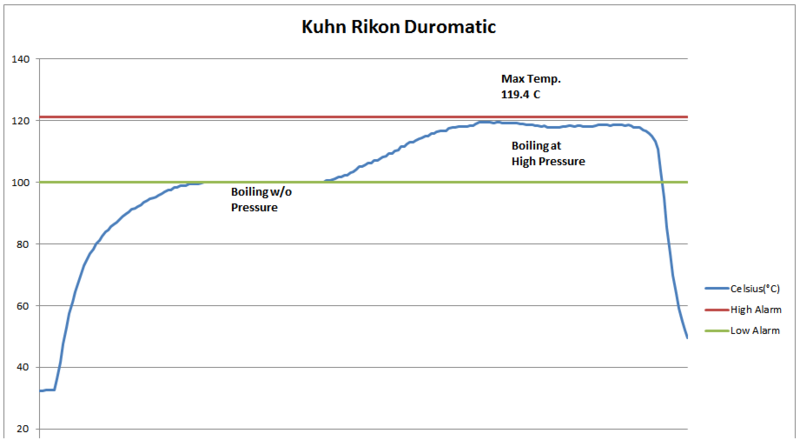 The Kuhnn Rikon Duromatic is the most energy efficient pressure cooker I’ve tested so far (knob position 1.6 vs 2.75 for Fagor Futuro). Releasing pressure by pushing the indicator, as instructed in the instruction manual, for the normal release requires the cook to stand there and push the indicator for approximately 2 minutes. The vapor is diffused by the decorative valve cover and wafts around the lid (not shooting in any particularly inconvenient direction as with the Magefesa Ideal or Fissler Vitavit). The Kuhn Rikon product manager told me of a faster, undocumented, way to release pressure by pulling up the indicator – I tried it released all of the pressure in less than 30 seconds! Kuhn Rikon has another model with a pressure valve that allows the cook to release pressure automatically by twisting the indicator. They call it a two-stage pressure release (seen here) – I will update this review with information about how this “automatic” release works, should I have the opportunity to try it. This brings us to the only weak spot in Kuhn Rikon’s durability: The decorative housing cover. It is held by three heat resistant plastic clips. They are subjected to the cooker’s high heat, super-heated vapor and constant movement when it’s removed and replaced to clean and dry the valve – eventually breaking. In two years of using this pressure cooker often I have gone through two of these covers (illustration 3, below). This cover is not essential to the function of the pressure cooker, but not having it suddenly turns the beautiful cooker into something to hide from guests. Although the valve is one of the easiest to clean, it is made of small pieces (1st illustration, above) so the cook will want to ensure that there is a screen over the sink drain so as not to loose any of the small essential pieces of the valve. The manual states that all parts must be hand-washed. 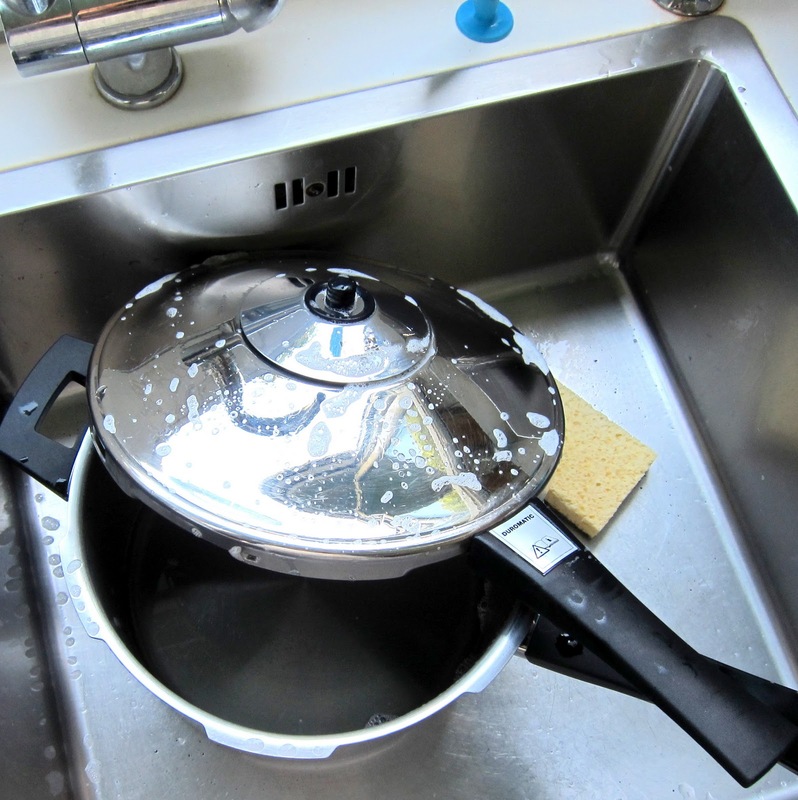 The thick metal base prevents most foods from scorching – but if they do (due to the cook not adding enough liquid or keeping the heat to high during cooking) the high-quality stainless steel will let most food comes off with the swipe of a sponge or a short soak of soapy water. All of the Kuhn Rikon pressure cookers come standard with a rack. 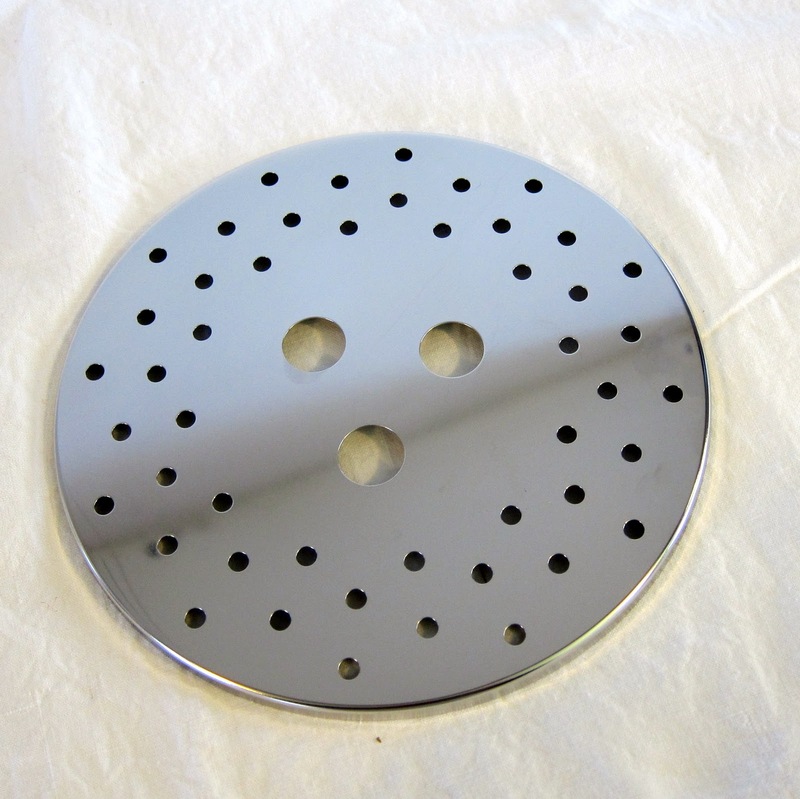 It is useful when making jams, or wanting to keep delicate things off the bottom of the pressure cooker, but a bit of a disappointment when I might want to do advanced pressure cooking techniques that require a trivet or steamer basket. It is too low to be used as a trivet and, if flipped over, the edges are too thin to use it as a steamer basket. However, this is not a major ding since it is easy to purchase suitable substitutes. Also included is a brief and easy-to-understand user manual with an extensive ingredient cooking time tables. The Kuhn Rikon Duromatic is lauded by Modernist Cuisine as their favorite brand. Quality is commensurate with price for this pressure cooker and gets top marks from me, too, for consistency, quality, functionality. It is easy to use, and clean. The all-metal pressure valve has survived kitchen experiments other pressure cookers have not. Getting the hang of the right heat setting to maintain pressure takes a little longer with this precision instrument and a decorative piece could be reinforced to last as long as the rest of the cooker. The Kuhn Rikon Duromatic is the most energy efficient pressure cooker tested – needing less heat to maintain pressure than all other cookers in the Hip Pressure Cooking test kitchen. NOTE: This review was fact-checked by the Head of Marketing and Product Management at Kuhn Rikon (Switzerland) prior to publication. Any updates for the potential “two-stage pressure release” option on this model? I really don’t like the plastic clip wearing out. I’m sorry I don’t understand your question. The pressure release has nothing to do with the clips breaking off – that happens when the valve needs to be cleaned. having gone through many of these now (and kudos to your thorough review for picking this issue up) I am becoming convinced that what actually does in the clips in my kitchen anyway is thermal shock from fast release of pressure under a cold water bath. I went through 2 in 18 months but since I started removing it before dunking the 3rd has been fine for another 2 years! Do you have any experience or second-hand knowledge about the equivalence between this model and the “Top” version. I guess, most importantly, is there any reason to suspect that a “Top” version pot would be less-than in build-quality, reliability, etc? The main difference is that the Top Model has a hands-free release (well, you need to use our hand to start it but it doesn’t have to stay there). The pressure building and keeping mechanism under the lid is exactly the same in the Duromatic and Top Model. Starting about 5 years ago I replaced the 1950-1960 era Presto cast aluminum pressure cookers (2 1/2 quart, 4 quart, 6 quart, fryer, 16 quart canner) that I had inherited from my mother and bought at garage sales. Since I had devolved to doing just about all my cooking in pressure cookers, I bought Kuhn Rikon cookers plus glass lids: 2 liter, 3.5 liter, and 5 liter pressure saucepans, 2.5 liter pressure frying pan, and 12 liter stockpot. I use them for everything I cook, wash them in the dishwasher, and have not broken any of the little clips or other parts (yet). I keep thinking I should get an Instant Pot and/or a 5 liter braiser, but am having trouble justifying either because I have not been prevented from cooking anything so far. So please tell me: What could I do with an electric cooker or with a braiser that I can’t do with what I have (or do better)? And is there something else I should consider? You can pressure cook the same things in electrics that you can in stovetops (it takes a few minutes longer and a little extra liquid) – the main difference is that you can punch-in the cooking time and leave the house. Or, you can program electric pressure cookers to start. Last night I started dinner in my pressure cookers and I went next-door to visit my neighbors! Unfortunately you cant’d do that with ANY stovetop pressure cooker that I know of. I’ve found cookability in the UK consistently reliable for spare parts. They also have a pretty comprehensive range. They are happy to send them anywhere in the world. But I am sure there are closer places to you. Thank you for producing such a wonderfully helpful website; we use it all the time. Our budget pressure cooker has given up and we’re looking to upgrade. Kuhn Rikon looks to be a great choice, but we are struggling to understand the differences between all of the Duromatic models (Supreme, Inox, Top, Classic, Hotel, Ergo). Their own website isn’t much use! Could you please offer some words of wisdom? Hotel is their commercial range. Large diameter (28cm) and a much heavier duty gasket. They use stubby handles that are less likely to be knocked in a busy kitchen. They are also less likely to be used as climbing aids by toddlers. Which is why I have them. The pot itself seems to be the same gauge metal as the others. Top: Uses a different pressure release system. where you turn a knob rather than push a button. It looks to be easier to use, but I haven’t tried it. One model was made in China rather than Switzerland, but I am pretty sure they dropped that one. Quality consistency issues with it. Hi Greg, thank you for your reply. After more digging it turns out that the Supreme is the Classic but with recipes printed on its blue steam diffuser; it sells as the Anniversary edition on their US website. The Ergo apparently ‘sits well in the hand’ thanks to its ‘ergonomic handles’ and the Comfort communicates with a mobile app via Bluetooth! The Inox and Hotel models seem to be the only widely available models in the UK. We probably won’t need the extra durability of the Hotel, so Inox it is! I really appreciate your helpful review. I have had a hi-dome Prestige all my life, and use it for soups, joints of ham, and particularly for steamed puddings, e.g.suet sponge puddings and of course Christmas pudding. For both of these, it is important to be able to steam the pudding, for perhaps 15 mins, with the steam escaping gently, before increasing the heat and coming up to pressure. I can’t see anyway of being able to steam with the Kuhn Rikon. Could you confirm that it is possible please. I don’t want to buy one and then find it isn’t possible Thank you very much. Just don’t lock the lid. Or use a plate instead. I use a glass lid from a saute pan that just happens to be the right size. When it is time to start pressure, put the normal lid on and lock it into position. Here is one I do regularly in my 12l Kuhn Rikon. A smaller pot will work too but my 5l PC is a frypan style so it is not suitable. but it is essentially the same process. She uses a 6l PC. Greg, thank you so much for your reply! I only came across your site yesterday when I was looking for info re the Kuhn Rikon pressure cooker, and read your review. i’d found the instruction manual on line as well, but nowhere could I find how to steam. What you say is so obvious! So now I am reassured, and I’m hoping will be given a KR pressure cooker for Christmas, to replace my Prestige. I think I will be going with a larger 8 litre model with two handles, as I want to make sure it is big enough. But one further question: how do I choose between the two 8 litre ones. It is quite hard to find what the difference is between them. Can you possibly help me identify which one I should choose? I did a quick search and found 7 8 litre models. Plus a few 7 litre ones. I haven’t listed them. I have the 5 and 12 litre Hotel models. They are designed for commercial use and have a much heavier gasket than the 2.5 litre Inox model I also have. The metal of the pot itself seems identical. But I am no metallurgist. On the face of it, the metal steam deflector would seem to be more durable than the plastic one. But it still has plastic clips to hold it in place. Two of mine have broken. SO I have my dubts. Still it looks really stylish. The TOP models use a knob to release pressure rather than pushing a button. I suspect it is considerably more convenient. But I have no personal experience with it. I think the Bluetooth connectivity of the Comfort model is just a gimmick. Without being able to control the heat, it is largely meaningless. THey should have made a proper electric. I just stay in the kitchen and glance at the indicator from time to time. I usually read a book if it is a long cook. Which reminds me. The Kuhn Rikons are REALLY quiet. You cannot leave the kitchen and rely on the sound of the PC to tell you all is working well. They do get a little noisier just before going into emergency release, but it is still quiet compared to my mother’s old weight operated PC – A Namco: probably a brand you have never heard of, but similar to the Prestige. The different diameters will affect how tall the pot is. I have heard comments that the 22cm is too tall to be convenient at 8 litres as it is too tall to stir and turn things successfully. (Before/after pressure cooking) But again I have no personal experience. All things considered I would probably buy the KR3764 if it was my decision. Or the Inox if that one is too expensive. BTW. I am not the operator of the site. That honour goes to Laura. I am merely an interested bystander. I have this pressure cooker and hate it. I have a professional gas stove with burners that can be adjusted from tiny flames to a roaring fire. I stopped using the pressure cooker because I had to stand over it and adjust the flame constantly. @Mona, I have a KR PC and absolutely love it. But it’s possible this PC isn’t the best match for your stovetop. My PC holds pressure steadily without intervention on an electric coil burner stovetop. It is trouble-free and dependable. Purchasing an inexpensive portable coil burner or even an induction plate would be one way of putting your PC back into service. There are other posts on this website that report using a KR on a gas burner can be high maintenance. Good luck. Greg, thank you again for your advice back at the beginning of December. i bought an 8 litre KR and I am completely delighted with it. It is on the heavy side, but i’m used to cooking with cast-iron pots so that is no problem. I particularly appreciate it’s bigger size, so I can pre-cook larger quantities of marmalade, for example. It is just so much easier to use, and maintain at a constant temperature, than my old much-loved prestige hi-dome. And so quiet! Thanks for the great information that you share in this blog, I find it always helpful and inspiring. It helped me to choose the best pressure cookers. I just published a post with comparison of the best pressure cookers (Spanish) and set you as a worldwide reference. Your work is awesome! Thanks Pablo! Very well-done reviews! I have this in the hotel version. I bought it for a once in a lifetime purchase for my large family . After two years, replaced valve parts, I am left in tears… all the plastic bits have broken, the handles have unscrewed and won’t tighten as the screw threads have worn down, the complete top cover won’t go on. I have an email from the store I bought it from saying the manufacturer said the top cover was unnecessary and should work fine without !!!! So it spits pressured hot water everywhere and on my kids walking past … stopped using it. I’m so very disappointed in this when I thought I was buying the best of the best. Yes the top cover is more than a little disappointing. I spoke to a rep a few months ago who said the plastic gradually goes brittle in the high heat environment of steam release. I still think it should not happen. There are other ways to achieve the same end. They HAVE improved the clips – more robust plastic – recently but I suspect it will just delay the inevitable. Why they couldn’t spend a few extra Euros on a better design (possibly spring steel) is beyond me. I replace one on one of my three Kuhn Rikons every year or so. and they are not cheap. I buy mine from a KR specialty dealer in the UK. I am surprised you have been having trouble with the handles. I have had no problems there at all. I replace my covers regularly so I don’t really notice. One did make excessive noise that could have been spitting, and on inspection, I discovered the emergency valve needed replacing as it was a little loose. No problems since then. Megan, Greg’s info on the emergency valve may help. Also, all the plastic bits wearing out so soon seems premature to me. I’ve used my cooker about three times a week for 3.5 years and haven’t had to replace anything yet. But I use it on an an electric coil burner, which is not as dynamic a heat source as gas flame, I never turn up the heat all the way to High, as most recipes instruct, I don’t use cold water releases, and I do use natural release almost always. It was never a strategy — just my way of cooking. So my cooker possibly leads a gentler life than most, which may explain its low maintenance. But I would expect a KR brand PC — especially the hotel line — to be more durable than you have described, and I would feel disappointed, too. I have found Kuhn Rikon reps in the U.S. to be invariably motivated to be helpful. I usually request my call to be transferred to the rep who is most experienced in pressure cooking, where I get the best answers. Good luck. I love my pressure cooker set. I also have the hotel size 12L and would like to cook a 20-lb. turkey but nowhere can I find a cooking time list so I can determine how many minutes per pound. Also is there a minimum amount of liquid for the larger 12L size? Annette, you’ll have to experiment. I don’t have the cooking time for whole turkey because the bones are so thick they impede penetration of heat. I would try double the chicken cooking time (20min x 2) and then take a temperature reading in the inner-thigh to check if it has reached 165°F/75°C. This is just a guess – I can’t promise good results. Thank you. I will be experimenting during the Christmas season. Here’s a chuckle for Kuhn Rikon PC fans. Some of us will recall a few years ago America’s Test Kitchen, an influential television cook show in the U.S., rated the KR 8-quart PC poorly in their review of stovetop PCs. We users knew better. Since then, Chris Kimball, host and originator of the show, has left ATK and started a new cook show/cooking school venture called Milk Street. Milk Street has is now selling a new line of cooks tools at Sur La Table and has partnered with Kuhn Rikon to sell their 5-quart Duromatic PC. The small plastic clips on the valve control is a constant problem. Replacement of that cover is quite expensive. With all Khun Rikon’s knowledge, there must be an alternative material to replace the clips. As you say, the cover is only decorative, and has proven to cause the PC to lose points. If you won’t replace it with a better material, gives us warranty or reduce, dramatically, the price of replacement. I wonder if anyone know what can be used to clean the inside and outside of the Kuhn rikon Duromatic? Would the use of any cleaning products (including bicarbonate soda) invalidate the warranty as the manual mentions a titanium coating that could be affected by some cleaning products?